You may ask, why do we need to use these photo editing apps? Well, we need our photos to look stunning as they can be whether for social media use or for printing and safekeeping. Photos speak a thousand words, so we better make our photos look better. 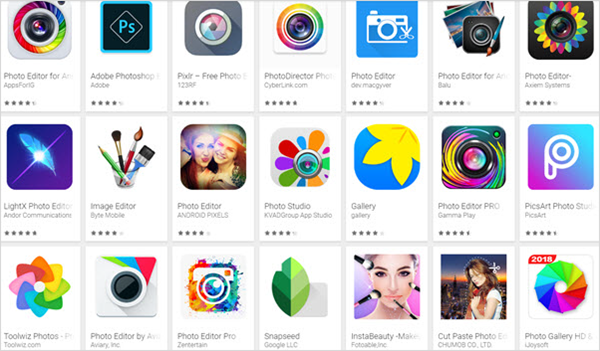 Luckily, there are literally tons of photo editing apps in Google Play Store. Unfortunately, it has almost become impossible to choose which app to use. No need to go over each of the apps because we did that part of the work for you. 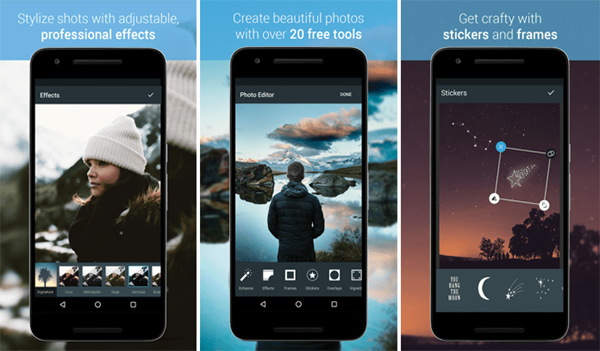 Here we present you the list of the top ten best free photo editor apps for Android in 2018 (yes, this is an updated list!). We will also discuss why we think they are the best photo editing apps. Important note: When deciding which Android photo editor to use, always go back to where do you want to use your photo. Is it for social media use? Is it for printing? Is it for sending through email? Your goal will determine which app will work for you. If you want a clean interface which is also easy to use, Snapseed is the right choice for you. Some of the bonus features of this app are that it supports raw images, retouching tools and provides good outputs. And best of all, this app is for free. Sharing options: Does not come with sharing feature, but results can easily be shared on Facebook, Instagram and other installed apps on your device. We heard that experienced photographers are highly recommending this photo editing app. But here’s our take on it. Snapseed is for extremely detailed photographers who are very picky when it comes to their photo tone, contrast, etc. As for use of less serious photographers, this photo editing app has traditional tools which will also teach us the basics of how to make photos look good. Are you looking for a fun picture editing app for your Android phone? PicsArt may be the app for you. This app offers all the fun things including mashups, overlays, collages, filters, frames, and stickers. This app also supports raw files. And best of all, you can access all the features without needing to do in-app purchases. Sharing options: This app will allow you to share your edit results on Facebook, Instagram, Twitter, Tumblr, email and other text messaging app installed in your device. First, if an app is fun, we automatically love it! We love the balance between the technical aspect of this app and the creativity it allows us to use. But most of all, we love that it’s fun and even addictive! If you are looking for an photo editor for Android which will allow you to have fun with filters, then Cymera is your bet. Some of the best features of this app include spot metering, retouching and a stable shooting mode, an essential for an app which started as a selfie app. Sharing options: Allows sharing of photos to social media sites including Twitter and Facebook. If you love adding clip art, stickers, frames to your photos you, then Cymera is your favorite. But we love that this application is fun and simple. What’s unique about this Android photo editor is its open source. As such, this app is loaded with features to help you take a perfect shot. Its features include ISO and exposure controls, exposure lock, auto-stabilization, shutter controls, countdown timers and voice triggers. Being an open source app, its functionality continues to expand. Sharing options: Allows saving of photos for sharing on installing social media apps on your device. First of all, we love that it is open source meaning. It’s free and it has the potential to expand and still be for free. Second, we love that it has pro-controls, making us learn more about photography. Third, you can take photos by saying cheese, which is pretty cool. Pixlr Live is a product of Autodesk software which has a good reputation of helping designers, engineers, visual artists, students for years. This fact makes this application highly rated and popular. The app features loads of photo editing options. Some of the notable features include red-eye removal, whiten teeth feature, and enhance tool and filters. It is perfect for designers. You can edit photos on the go which makes it perfect for beating deadlines. You can get the tools on the software condensed into your Android phone. It is very convenient: A bonus feature is the templates, which makes work a lot easier when designers get the creative block and run out of ideas. In many of the forums online, Adobe Lightroom Mobile has the most number of recommendations as best photo editor on Android. This app allows for editing of RAW image format and edits those photos using different pre-sets which come with the app. One thing that makes this app different is you can only use it for free during a 30-day trial, and you have to have a Creative Cloud subscription in order to use the app permanently. This app is also for designers who are off of their desktops. You can sync Adobe Lightroom Mobile to the Adobe Lightroom on your desktop. This makes work more convenient. As a professional tool, this photo editing app on Android comes with the basic tools needed for the craft. This essential for designers with deadlines to beat; you can basically work while waiting for your meal in a restaurant. We are listing BeFunky on number four, because of its simplicity. You can easily get familiar with its filters, effects and other tools. True to its name, this photo editor is indeed funky. Sharing options: Allows sharing from the app to Facebook. Unlike many picture editing apps, BeFunky has basic and useful tools. We also did not have to deal with the difficult interface. The effects featured on this app which you can add to your photos are almost unlimited. We think this app has the most effects, fonts and filters to decorate your photos. 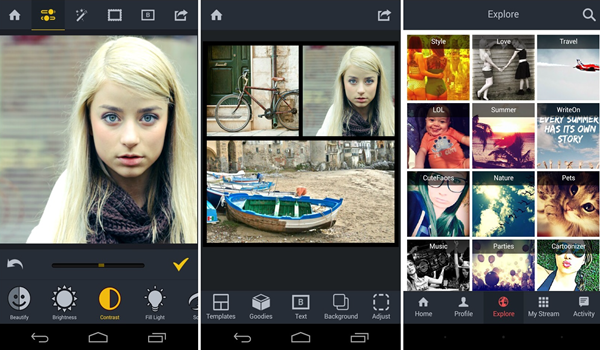 For that reason, we’re making it the most addictive photo editor on Android phone. 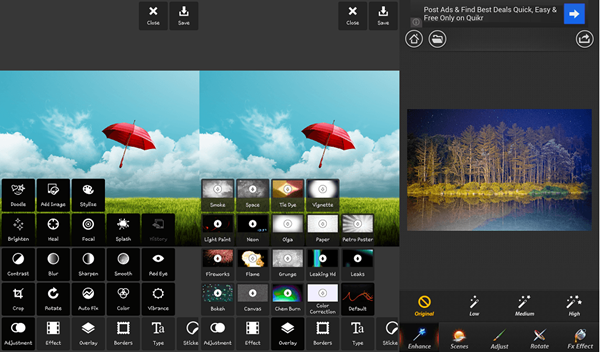 If you are familiar with Adobe Photoshop on your desktop, then you will love this app. Some users are hard-core purists and would only acknowledge Photoshop as the only option, this app is for them. It features background blur, cinema effects, face beauty and much more features which can be found only on the desktop version. This app is available for free in the Google Play Store. Sharing options: Allows saving of photos. Sharing on social media can be done using the gallery. We love working with professional tools that’s why we like working with Photoshop for Phone. It is very helpful and we are already used to the tools that it features. For new Photoshop user, it can be a challenge. But for experienced Photoshop user, this app is convenient because they won’t have to learn how to use it. Are you a fan of memes, and would like to up your meme game? Aviary is not just a powerful photo editor on Android phone but also offers its users a great way to create memes. Its features include effects, frames and filters. Sharing options: Allows saving of photos to social media. One thing that we look for in a picture editing app on the mobile phone is the versatility of its tools. We want to be able to use one editor for all our needs. And Aviary seems to have it all. We can be creative. We can be fun. And we can use it for work. VSCO is the favourite of social media influencers. If you see amazing photos on Instagram, chances are, they were edited using VSCO. Users of this app vary from professional photographers to social media addicts. 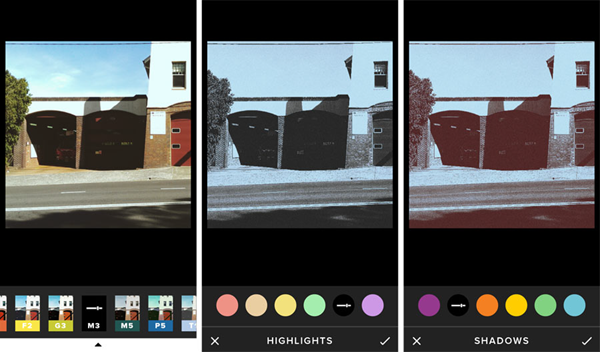 The app features an easy to use set of editing tools and exclusive filters. The catch though is, if you want more filters you will have to buy them (they’re really not expensive, but you have to pay to add filters). 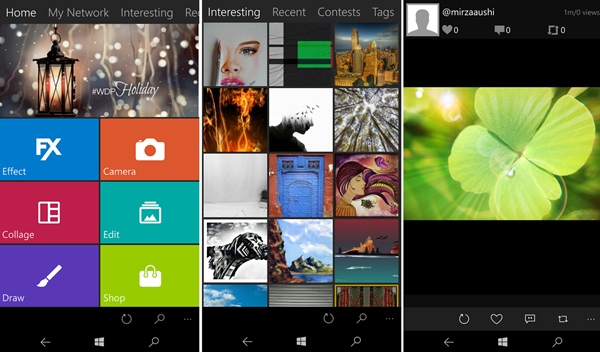 Sharing options: Allows saving of photos to your gallery where you can share photos to Facebook, Instagram or Twitter. Out of all the photo editor apps for Android phones, this one is the easiest to use which also gives you quality results. You can crop, skew, brighten, remove shadows, and adjust the exposure and everything you need to enhance your photos. We also love the VSCO exclusive filters. The VSCO community is also another great feature for inspiration hungry photographers. VSCO is both for hobbyists and professionals. Recommend: Accidentally deleted some beloved photos from your Android phone and looking for a way to get them back? Please try Gihosoft Free Android Data Recovery, it’s a superb Android file recovery software with advanced scanning technology and powerful anti-delete capabilities. By using this program, you can recover deleted photos from your Android phone effortlessly.